You might remember when ‘selfie’ was declared the word of the year by the Oxford dictionaries. Shortly after, the term ‘shelfie’ (a photo of your bookshelf) became an instagram hit. Looking at other people’s bookshelves, it turns out, is more interesting than we might first imagine. 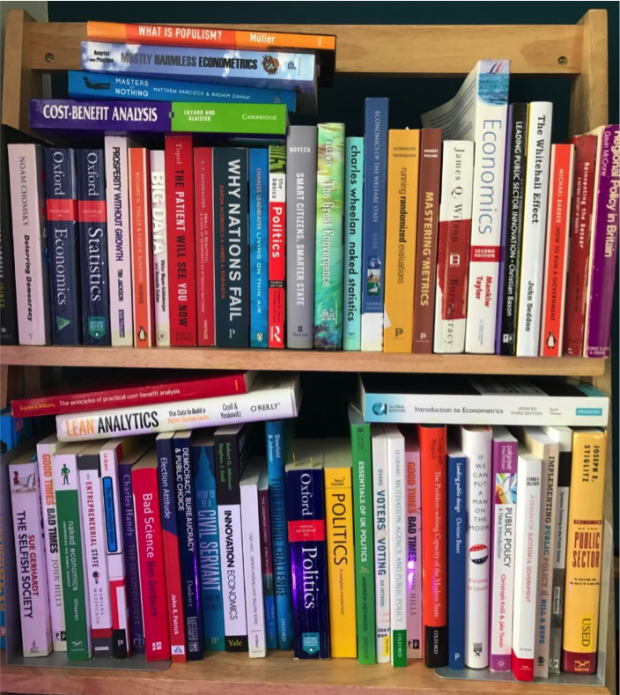 Over the last year, since I started on the London School of Economics Executive Masters in Public Policy (EMPP), my bookshelf has changed beyond recognition. Despite good intentions I must confess I don’t have vast amounts of time to read for pleasure. I was therefore delighted to find the EMPP reading list to be both interesting and incredibly useful. The course was created by the government’s Policy Profession to enable senior policy-makers to build cutting edge policy analysis skills. They have carefully curated the latest thinking into modules spanning many subjects as an intensive whistle-stop tour of different aspects of policy in practice. So far we’ve delved into policies on Brexit, health and social care, schools, cities and regional development, as well as the theories of political science, economics and empirical methods (such as regression analysis). Over the year I have learnt a huge amount about the way policy is made, the complexities, contradictions and dynamics of developing and delivering change. My time at LSE has been much more rewarding than I expected, and more relevant. In some cases it has forced me to read books I’ve bought and never got around to reading. But in most cases it has put things on my bookshelf I would never dreamt of buying. If I had to pick a few favourites this year they’d include: The ‘The Patient will See You Now’, ‘Election Attitude’ and ‘The Checklist Manifesto’. As well as the core textbooks, ‘Why Nations Fail‘ and the highly amusing ‘Naked Statistics’. It made me wonder what books other policy makers are reading, and for that matter, what the academics who are experts in this area are finding at the cutting edge of practice. Choosing the books that will best inform and frame thinking is important. And keeping abreast of the latest thinking a necessity in our rapidly changing workplace. Take for example Paul Maltby’s recent compendium of digital, data and design books for policy-makers or Leisa Reichelt’s excellent reading list. The challenge is often finding both the time and the motivation to read all the interesting things that are out there. The Masters course provides both, and an amazing cohort of fellow students to share ideas and think about how to put them into practice. So despite the lost weekends and lengthy reading I would wholeheartedly recommend this course (which is open to civil servants) or its ‘sister’ course the Executive Masters in Public Administration to those intrigued by how the world of policy works.